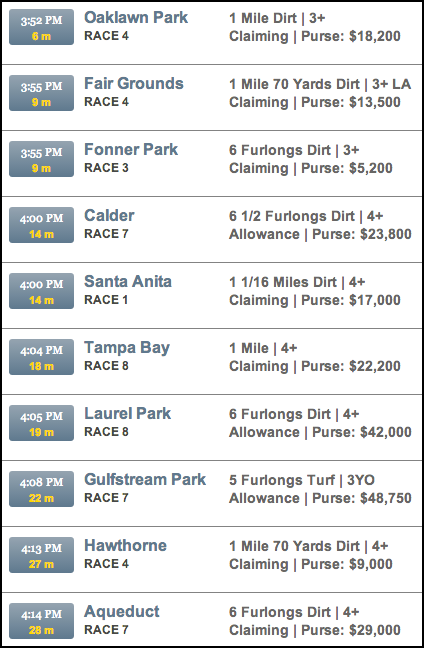 We have added a new Upcoming Races menu to the TimeformUS site. Click it to open the Upcoming Races menu. This menu will display all remaining races today, from all tracks, listed in post time order. We use our live minutes to post feed to give you the most accurate post times available. For tracks where we do not have live minutes to post data, we use the published post times. Upon opening the menu, click any race to be taken to the PPs. Using this menu will significantly cut down the time and number of clicks it takes you to navigate from race-to-race and track-t0-track. Taking a look at tomorrow’s stakes race at Santa Anita, but want to see the upcoming race at Aqueduct? You’re two clicks and about two seconds away. If you haven’t bought PPs, you’ll instead be taken to the Preview page for that race, and you can click any horse’s name to buy PPs. Please note that this is our first version of this menu, and we’ll be adding more features to it in the days and weeks to come. Yeah, we know. We’re going to add a racefinder view option to it, but we wanted to get it out there to start. Will also add claiming prices and perhaps race ratings. We think you’ll enjoy it during the raceday as it is wired to tote for most tracks. This new feature eliminates the need to go back and forth between the Race Finder and PPs, but the Race Finder settings do not stick and carry over to this menu even though it gives you the option to go there and change them. If you are only interested in certain types of races you still have to go to Race Finder. It would be really nice if your settings carried forward, but this is a good feature as is.